The passing of the Tax Cuts and Jobs Act into law as of January 1, 2018 has eliminated the tax deductibility of contributions that give the "right to purchase tickets for seating at an athletic event in an athletic stadium of such institution." We have been monitoring the college athletics landscape and working with our leadership to determine what, if any adjustments would need to be made to our operations. In order to be compliant with the new legislation, we will be making a couple adjustments to how our priority seating program for men's basketball is administered. Historically, gifts to the Owl Club Annual Fund have been used to satisfy priority seating requirements for basketball season tickets. For a donor/season ticket holder to be granted access to purchase seats in a preferred location, Owl Club Annual Fund gifts were due by June 30 for the upcoming season. 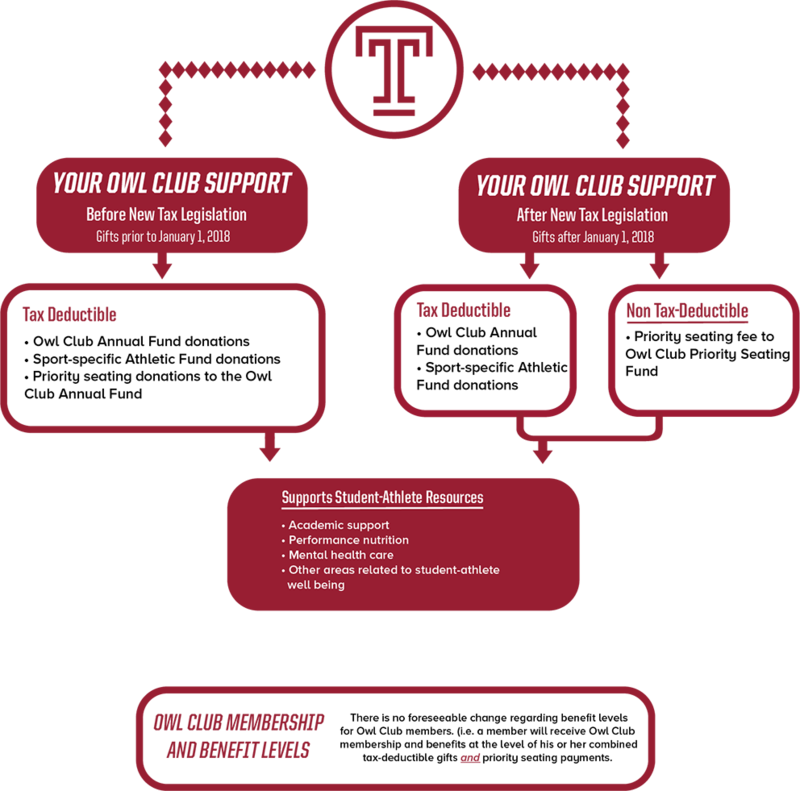 With the change in tax law, Owl Club Annual Fund gifts cannot be used for ticket benefits and retain their tax deductibility. Payments made to access priority seating must now be classified as a fee rather than a donation and placed into a new fund designated the "Owl Club Priority Seating Fund." Please be assured both philanthropic gifts and priority seating fees will continue to support the same student-athlete initiatives. In relation to Owl Club benefits and membership levels, there will be no foreseeable change. The Owl Club will continue to count Owl Club Priority Seating payments in addition to any philanthropic athletics giving to determine your benefit and membership levels for the coming fiscal year. If you have any questions, please don't hesitate to reach out to your Owl Club representative or to our office at 215-204-2582 and owlcub@temple.edu. Hooter T. Owl is a Temple Owl Club supporter who annually contributes $1,500 to the Owl Club Annual Fund and has four basketball season tickets in a priority section requiring a $300 per seat donation ($1,200 total). Stella White is a Temple Owl Club supporter who annually contributes $400 to the Owl Club Annual Fund and has two basketball season tickets in a priority section requiring a $200 per seat donation ($400 total). Conwell Cherry is a Temple Owl Club supporter who annually contributes $1,000 to the Owl Club Annual Fund and has two basketball season tickets in a priority section requiring a $300 per set donation ($600 total). Acres O. Diamond is a Temple Owl Club supporter who annually contributes $500 to the Owl Club Annual Fund and has two basketball season tickets in a non-priority section. Why do my Owl Club donations no longer cover priority seating requirements for Men's Basketball? The US government passed the Tax Cuts and Jobs Act in late 2017. The passing of the Tax Cuts and Jobs Act into law as of January 1st, 2018 has eliminated the tax deductibility of contributions that give the "right to purchase tickets for seating at an athletic event in an athletic stadium of such institution." With the elimination of this tax deduction, will Temple Athletics still require a payment to grant access to priority seats for Men's Basketball season tickets? Yes! These priority seat payments are essential to our ability to deliver a peerless student-athlete experience. Am I paying more or less for season tickets as a result of this tax change? Ticket prices may change from year to year, but your priority seat payment will not change for the upcoming '18-'19 season. We are simply depositing what you would have paid to the Owl Club to cover that cost into a new fund, Owl Club Priority Seating fund, in order to be compliant with the new tax law. How will benefits and membership levels be determined? Temple Athletics will continue to count these payments along with your philanthropic gifts to athletics to determine your Owl Club membership level and corresponding benefits. Does this change the priority point system? Priority points will remain unchanged for the upcoming fiscal year. The only adjustment is that points can no longer be used for ticketing purposes in our home venues. Points will still be utilized to determine away game and postseason ticket access. Will Owl Club Priority Seating payments count in my University giving totals? Priority seating payments are not tax deductible, however they will count towards your university giving totals based on guidelines issued by CASE, the Council for Advancement and Support of Education, an international association serving educational institutions in advancement. How does this new tax law effect my tax situation? We are not able to offer you specific tax advice based on your individual situation. As always, we recommend you consult with your tax advisor to determine how your philanthropic choices impact your specific tax situation.